Tales from Earthsea was the third of these three titles that I watched. It was directed by Hayao Miyazaki's son, Goro Miyazaki, and... actually, I'v already written a review for Disney's DVD release so there's little point in repeating that entire review here. The film hasn't changed, just been updated to high definition, so if you're unfamiliar with the movie then please go check out that review first. It's okay, I'll wait. Ready? Okay, so now that you know all about the movie and my thoughts on it, lets take a look at the blu-ray's extra features. The longest extra (not including the original Japanese Storyboards which are the same length as the film) is The Birth of the Film Soundtrack. It's about an hour long and gives a very complete look at the way the movie's soundtrack was created. There are a bunch of interviews and a lot of behind the scenes footage. It's an interesting watch just note that it's in Japanese with English subtitles so some of you may not like that. In contrast to the long and detailed featurette of Birth of the Film Soundtrack, Behind the Studio: Origins of Earthsea is quite short at only about four minutes long, and it really feels like more of a commercial than a making-of featurette. It's not bad but compared to the Birth of the Film Soundtrack extra this one is a bit pathetic. Then of course there are the trailers, but who really cares about those. We always used to fast forward through trailers back in the VCR days. I suppose it's good for them to be included for posterities sake but I'm sure most people would skip those. I'm sure most people would skip the storyboards as well. A little may be interesting but every storyboard for the entire movie isn't exactly my idea of a good time. 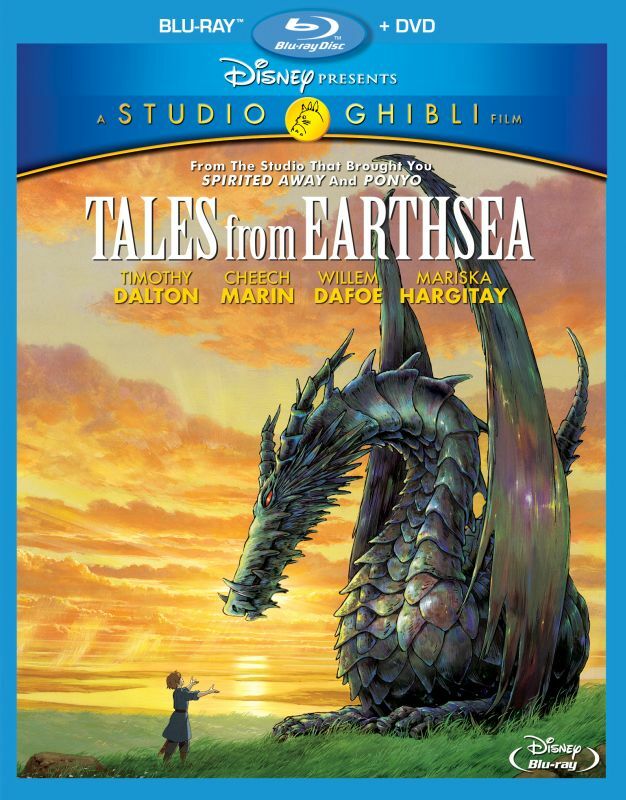 An epic animated adventure directed by Goro Miyazaki, “Tales From Earthsea” features the voices of Timothy Dalton, Willem Dafoe, Cheech Marin and Mariska Hargitay. Based on the classic “Earthsea” fantasy book series by Ursula K. Le Guin, “Tales From Earthsea” is set in a mythical world filled with magic and bewitchment. In the land of Earthsea, crops are dwindling, dragons have reappeared and humanity is giving way to chaos. Journey with Lord Archmage Sparrowhawk, a master wizard, and Arren, a troubled young prince, on a tale of redemption and self-discovery as they search for the force behind the mysterious imbalance that threatens to destroy their world. Featuring a timeless story and magnificent hand-drawn animation, “Tales From Earthsea” is now available for the first time ever on Disney Blu-ray.